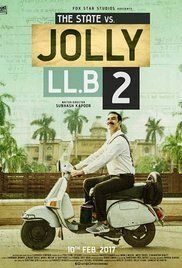 Jagdishwar Mishra a.k.a Jolly (Akshay Kumar) is a Lucknow based lawyer who works as an assistant (Munshi) to one of the most famous lawyers of Lucknow, Rizvi Sahab. He hails from Kanpur. In order to arrange money for his own chamber, Jolly lies to a pregnant lady, Hina (Sayani Gupta) and convinces her to give him rupees 2 Lakh as fees so that Rizvi Sahab would fight her case. Jolly uses that money to pay the final payment for his own chamber and opens it with a ceremony. When Hina finds out that she has been bluffed by Jolly, she commits suicide. Everyone blames Jolly for her death, including Jolly's father, who worked for 30 years as a clerk for Rizvi Sahab. Filled with guilt, Jolly along with his wife Pushpa (Huma Qureshi) & fellow lawyer Birbal (Rajiv Gupta), decides to fight Hina's case & files a PIL. He soon discovers that Hina's husband Iqbal Qasim (Manav Kaul) was killed in a fake encounter by Inspector Suryaveer Singh (Kumud Mishra) on the very next day of their marriage in order to get a promotion. Singh also shot a fellow constable, Bhadouriya, in his thigh, in order to show the encounter genuine. Bhadouriya later died due to excessive bleeding, Inspector Suryaveer Singh then hires Lucknow's best lawyer Pramod Mathur (Annu Kapoor), his friend, to fight his case. Read more on Wikipedia.